Iron Maiden moved into the big league with the album that ushered in the band’s classic era. Here’s our retro review of The Number Of The Beast! After Iron Maiden (1980) and Killers (1981), Maiden and their management faced a state of upheaval that could easily have been the end of a lesser band. But they had also found their sound, particularly with the coming of producer Martin Birch and guitarist Adrian Smith for their second album. They just needed a voice. Vocalist Paul Di’Anno was booted, one of many Maiden exits in the early days. Losing the lead singer is a dangerous gamble for any band, as Maiden would learn so well at a later stage of their career, but in the case of Di’Anno they had no choice. Click here to read about Di’Anno’s exit from Iron Maiden! As if the singer’s departure wasn’t enough, the NWOBHM movement that Maiden somewhat reluctantly spearheaded was already waning, and a lot of people were expecting Iron Maiden to disappear. But in late 1981, Steve Harris’ band had no intention of becoming yesterday’s news, and responded to adversity by upping their game considerably, perhaps into territory few observers foresaw. They recruited Samson singer Bruce Dickinson, created their most ambitious music yet, and released a number one record with The Number Of The Beast in March 1982. The Iron Maiden line-up that released The Number Of The Beast in 1982: Steve Harris, Clive Burr, Bruce Dickinson, Dave Murray and Adrian Smith. This album is home to some of the best-loved metal tunes of all time: Run To The Hills, The Number Of The Beast, and Hallowed Be Thy Name. Add to that the less well-known but equally majestic Children Of The Damned, The Prisoner and 22 Acacia Avenue, and you have a bona fide heavy metal classic on your hands. Producer Birch steers the ship with a steady hand, building on the sound of Killers and allowing the new singer room enough to make his mark, even pushing him to do so, as Dickinson would later explain in his autobiography. The battle is on: Derek Riggs’ artwork for Run To The Hills, the track that producer Martin Birch selected as first single. Dickinson’s operatic singing style takes the band into waters hitherto uncharted, perfectly conveying the drama and intensity of Harris’ lyrics, which are by now straying from the sometimes crude and vulgar words of the first two records to deal with out-of-body experiences, the occult, and historical events and conflicts. Dickinson’s voice is the perfect foil for these expressions and he would from this point on be thought of by millions as the ultimate, even the only acceptable, voice of Iron Maiden. Click here to read more about Bruce Dickinson’s arrival in Iron Maiden! 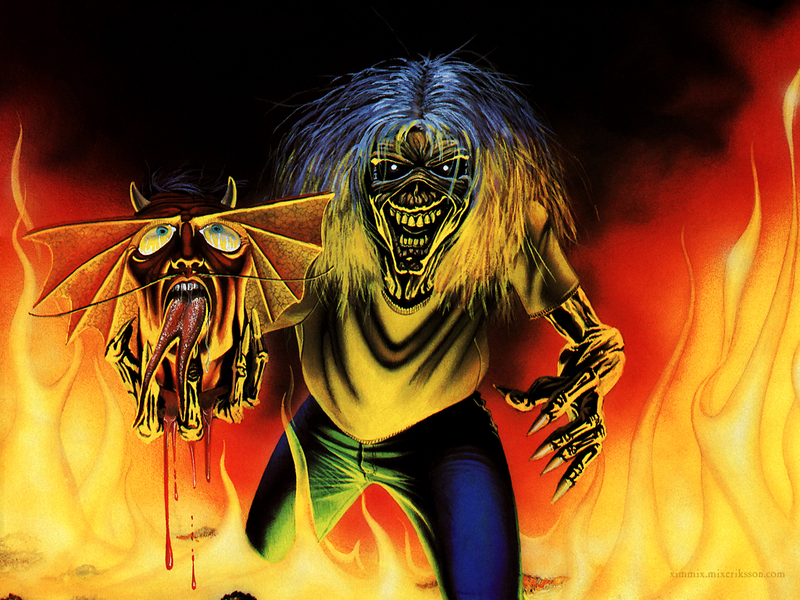 Eddie won: Riggs’ illustration for second single The Number Of The Beast. The picture disc re-release comes with a gatefold cover that opens to reveal a cool live shot of the band on the 1982 Beast On The Road tour, while the disc is illustrated with Riggs’ single artworks for Run To The Hills and The Number Of The Beast. The 180g black vinyl reissue replicates the original packaging nicely. Musically, Steve Harris has said that he felt Killers was stronger than The Number Of The Beast, and there are certainly great things to be said about the Killers album, as our previous retro review argues. But the Beast album edges it for two reasons: Dickinson’s triumphant arrival, and the complete world-class level of six of the songs. The record is only let down by Harris’ disappointing Invaders (the only Maiden album opener never to be performed live…) and the lacklustre Gangland, co-written by Adrian Smith and drummer Clive Burr. The 1998 CD remaster’s addition of the single B-side Total Eclipse (not to be found on the current vinyl or digital reissues) does not help matters. All these songs belong in a different league, one that the band has by now left behind them as they’ve started scaling the heights of their classic era. Click here for our retro review of 1983’s Piece Of Mind! For with The Number Of The Beast, Iron Maiden creates a benchmark few bands would ever match. And they prove why manager Rod Smallwood was 100 % right about a record deal having to look to the third album. That’s when the fun really starts. ← Sonisphere in Italy and France is on! Invaders disappointing? Well I’m going to have to disagree with you on that one. One of my favorite songs of theirs, and in my opinion definitely in keeping with their tradition of incredibly strong openers when they brought Bruce on board. Well, I won’t argue with that. Back in the Village is definitely the low point of Powerslave.